Mathematicians know that in all standard bases, the digits of √2 and π go on for ever, without falling into any regular pattern. These numbers aren’t merely irrational but transcedental. But are they also normal? That is, in each base b, do the digits 0 to [b-1] occur with the same frequency 1/b? (In general, a sequence of length l will occur in a normal number with frequency 1/(b^l).) In base 2, are there as many 1s as 0s in the digits of √2 and π? In base 3, are there as many 2s as 1s and 0s? And so on. But what number, a(6), satisfies the definition for bases 2, 3, 4, 5 and 6? According to the notes at the OEIS, a(6) > 5^434. That means finding a(6) is way beyond the power of present-day computers. But I assume a quantum computer could crack it. And maybe someone will come up with a short-cut or even an algorithm that supplies a(b) for any base b. Either way, I think we’ll get there, π and by. What’s special about the binary number 10011 and the ternary number 1001120221? To answer the question, you have to see double. 10011 contains all possible pairs of numbers created from 0 and 1, just as 1001120221 contains all possible pairs created from 0, 1 and 2. And each pair appears exactly once. Now try the quaternary number 10011202130322331. That contains exactly one example of all possible pairs created from 0, 1, 2 and 3. Again, the digits look increasingly random. They aren’t: they’re strictly determined. The d-string is in harmony. As the digits are generated from the left, they impose restrictions on the digits that appear later. It might appear that you could shift larger digits to the right and make the number smaller, but if you do that you no longer meet the conditions and the d-string collapses into dischord. What about when n = 100? Now the d-string is ungraspably huge – too big to fit in the known universe. But it starts with 1 followed by a hundred 0s and every digit after that is entirely determined. Perhaps there’s a simple way to calculate any given digit, given its position in the d-string. Either way, what is the ontological status of the d-string for n=100? Does it exist in some Platonic realm of number, independent of physical reality? Some would say that it does, just like √2 or π or e. I disagree. I don’t believe in a Platonic realm. If the universe or multiverse ceased to exist, numbers and mathematics in general would also cease to exist. But this isn’t to say that mathematics depends on physical reality. It doesn’t. Nor does physical reality depend on mathematics. Rather, physical reality necessarily embodies mathematics, which might be defined as “entity in interrelation”. Humans have invented small-m mathematics, a symbolic way of expressing the physical embodiment of big-m mathematics. But small-m mathematics is actually more powerful and far-ranging, because it increases the number, range and power of entities and their interaction. Where are √2 and π in physical reality? Nowhere. You could say that early mathematicians saw their shadows, cast from a Platonic realm, and deduced their existence in that realm, but that’s a metaphor. Do all events, like avalanches or thunderstorms, exist in some Platonic realm before they are realized? No, they arise as physical entities interact according to laws of physics. In a more abstract way, √2 and π arise as entities of another kind interact according to laws of logic: the concepts of a square and its diagonal, of a circle and its diameter. The d-strings discussed above arise from the interaction of simpler concepts: the finite set of digits in a base and the ways in which they can be combined. Platonism is unnecessary: the arc and spray of a fountain are explained by the pressure of the water, the design of the pipes, the arrangement of the nozzles, not by reference to an eternal archetype of water and spray. In small-m mathematics, there are an infinite number of fountains, because small-m mathematics opens a door to a big-U universe, infinitely larger and richer than the small-u universe of physical reality. “In 1997, Fabrice Bellard announced that the trillionth digit of π, in binary notation, is 1.” — Ian Stewart, The Great Mathematical Problems (2013). A story is stranger than a star. Stronger too. What do I mean? I mean that the story has more secrets than a star and holds its secrets more tightly. A full scientific description of a star is easier than a full scientific description of a story. Stars are much more primitive, much closer to the fundamentals of the universe. They’re huge and impressive, but they’re relatively simple things: giant spheres of flaming gas. Mathematically speaking, they’re more compressible: you have to put fewer numbers into fewer formulae to model their behaviour. A universe with just stars in it isn’t very complex, as you would expect from the evolution of our own universe. There were stars in it long before there were stories. A universe with stories in it, by contrast, is definitely complex. This is because stories depend on language and language is the scientific mother-lode, the most difficult and important problem of all. Or rather, the human brain is. The human brain understands a lot about stars, despite their distance, but relatively little about itself, despite brains being right on the spot. Consciousness is a tough nut to crack, for example. Perhaps it’s uncrackable. Language looks easier, but linguistics is still more like stamp-collecting than science. We can describe the structure of language in detail – use labels like “pluperfect subjunctive”, “synecdoche”, “bilabial fricative” and so on – but we don’t know how that structure is instantiated in the brain or where language came from. How did it evolve? How is it coded in the human genome? How does meaning get into and out of sounds and shapes, into and out of speech and writing? These are big, important and very interesting questions, but we’ve barely begun to answer them. But certain things seem clear already. Language-genes must differ in important ways between different groups, influencing their linguistic skills and their preferences in phonetics and grammar. 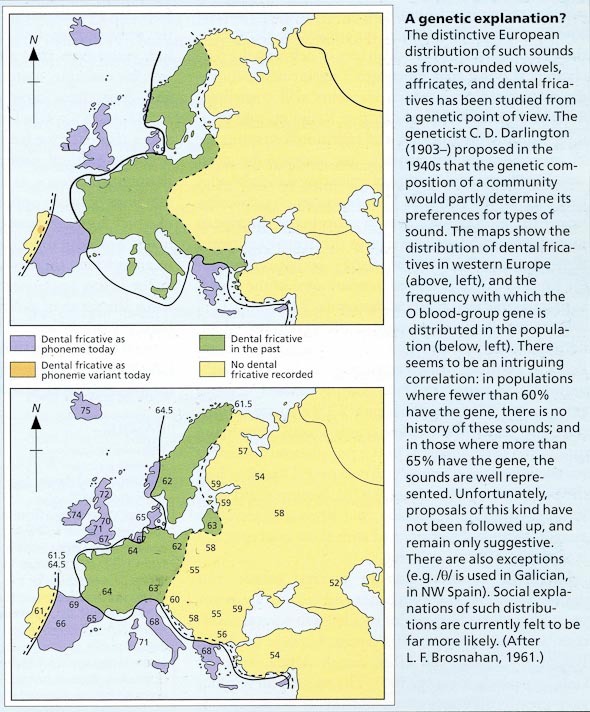 For example, there are some interesting correlations between blood-groups and use of dental fricatives in Europe. The invention of writing has exerted evolutionary pressures in Europe and Asia in ways it hasn’t in Africa, Australasia and the Americas. Glossogenetics, or the study of language and genes, will find important differences between races and within them, running parallel with differences in psychology and physiology. Language is a human universal, but that doesn’t mean one set of identical genes underlies the linguistic behaviour of all human groups. Skin, bones and blood are human universals too, but they differ between groups for genetic reasons. I disagree with Wigner: it is not mysterious or uncanny and there is a rational explanation for it. The “effectiveness” of small-m maths for scientists is just as reasonable as the effectiveness of fins for fish or of wings for birds. The sea is water and the sky is air. The universe contains both sea and sky: and the universe is maths. Fins and wings are mechanisms that allow fish and birds to operate effectively in their water- and air-filled environments. Maths is a mechanism that allows scientists to operate effectively in their maths-filled environment. Scientists have, in a sense, evolved towards using maths just as fish and birds have evolved towards using fins and wings. Men have always used language to model the universe, but language is not “unreasonably effective” for understanding the universe. It isn’t effective at all. It is effective, however, in manipulating and controlling other human beings, which explains its importance in politics and theology. In politics, language is used to manipulate; in science, language is used to explain. That is why mathematics is so important in science and so carefully avoided in politics. And in certain academic disciplines. But the paradox is that physics is much more intellectually demanding than, say, literary theory because the raw stuff of physics is actually much simpler than literature. To understand the paradox, imagine that two kinds of boulder are strewn on a plain. One kind is huge and made of black granite. The other kind is relatively small and made of chalk. Two tribes of academic live on the plain, one devoted to studying the black granite boulders, the other devoted to studying the chalk boulders. The granite academics, being unable to lift or cut into their boulders, will have no need of physical strength or tool-making ability. Instead, they will justify their existence by sitting on their boulders and telling stories about them or describing their bumps and contours in minute detail. The chalk academics, by contrast, will be lifting and cutting into their boulders and will know far more about them. So the chalk academics will need physical strength and tool-making ability. In other words, physics, being inherently simpler than literature, is within the grasp of a sufficiently powerful human intellect in a way literature is not. Appreciating literature depends on intuition rather than intellect. And so strong intellects are able to lift and cut into the problems of physics as they aren’t able to lift and cut into the problems of literature, because the problems of literature depend on consciousness and on the hugely complex mechanisms of language, society and psychology. Intuition is extremely powerful, but isn’t under conscious control like intellect and isn’t transparent to consciousness in the same way. In the fullest sense, it includes the senses, but who can control his own vision and hearing or understand how they turn the raw stuff of the sense-organs into the magic tapestry of conscious experience? Flickering nerve impulses create a world of sight, sound, scent, taste and touch and human beings are able to turn that world into the symbols of language, then extract it again from the symbols. This linguifaction is a far more complex process than the ignifaction that drives a star. At present it’s beyond the grasp of our intellects, so the people who study it don’t need and don’t build intellectual muscle in the way that physicists do. Or one could say that literature is at a higher level of physics. In theory, it is ultimately and entirely reducible to physics, but the mathematics governing its emergence from physics are complex and not well-understood. It’s like the difference between a caterpillar and a butterfly. They are two aspects of one creature, but it’s difficult to understand how one becomes the other, as a caterpillar dissolves into chemical soup inside a chrysalis and turns into something entirely different in appearance and behaviour. Modelling the behaviour of a caterpillar is simpler than modelling the behaviour of a butterfly. A caterpillar’s brain has less to cope with than a butterfly’s. Caterpillars crawl and butterflies fly. Caterpillars eat and butterflies mate. And so on. Stars can be compared to caterpillars, stories to butterflies. It’s easier to explain stars than to explain stories. And one of the things we don’t understand about stories is how we understand stories. 2:1 Now when Jesus was born in Bethlehem of Judaea in the days of Herod the king, behold, there came wise men from the east to Jerusalem, 2:2 Saying, Where is he that is born King of the Jews? for we have seen his star in the east, and are come to worship him. 2:3 When Herod the king had heard these things, he was troubled, and all Jerusalem with him. 2:4 And when he had gathered all the chief priests and scribes of the people together, he demanded of them where Christ should be born. 2:5 And they said unto him, In Bethlehem of Judaea: for thus it is written by the prophet, 2:6 And thou Bethlehem, in the land of Juda, art not the least among the princes of Juda: for out of thee shall come a Governor, that shall rule my people Israel. 2:7 Then Herod, when he had privily called the wise men, enquired of them diligently what time the star appeared. 2:8 And he sent them to Bethlehem, and said, Go and search diligently for the young child; and when ye have found him, bring me word again, that I may come and worship him also. 2:9 When they had heard the king, they departed; and, lo, the star, which they saw in the east, went before them, till it came and stood over where the young child was. 2:10 When they saw the star, they rejoiced with exceeding great joy. 2:11 And when they were come into the house, they saw the young child with Mary his mother, and fell down, and worshipped him: and when they had opened their treasures, they presented unto him gifts; gold, and frankincense and myrrh. – From The Gospel According to Saint Matthew. α’. Σημεῖόν ἐστιν, οὗ μέρος οὐθέν. β’. Γραμμὴ δὲ μῆκος ἀπλατές. γ’. Γραμμῆς δὲ πέρατα σημεῖα. 1. A point is that of which there is no part. 2. A line is a length without breadth. 3. The extremities of a line are points. That is the astonishing, world-shattering opening in one of the strangest – and sanest – books ever written. It’s twenty-three centuries old, was written by an Alexandrian mathematician called Euclid (fl. 300 B.C. ), and has been pored over by everyone from Abraham Lincoln to Bertrand Russell by way of Edna St. Vincent Millay. Its title is highly appropriate: Στοιχεῖα, or Elements. Physical reality is composed of chemical elements; mathematical reality is composed of logical elements. The second reality is much bigger – infinitely bigger, in fact. In his Elements, Euclid slipped the bonds of time, space and matter by demolishing the walls of reality with a mathematical hammer and escaping into a world of pure abstraction.